Barangay Bonifacio is located at the southern part of the Municipality of Calamba, Misamis Occidental. The first inhabitants of the area were Subanens and Concentrated at “Sugmaran” now sitio Sugnoran at Balonoan fertile valley with an area of more or less 300 hectares along the Langaran River. By virtue of the resolution pass and duly approved by the council of Bonifacio became a barrio. In 1937, through their unity, build a market and a school building. Don Bernardo A. Neri, President Council of Plaridel Misamis Occidental. Through his intercession and on motion of Vice President Casimero Quicoy, the Bonifacio come into existence. Barangay Bonifacio is an upland barangays located at the southern part of the Municipality of Calamba, Province of Misamis Occidental. It is bounded on the north by Barangay Salvador, on the south by Barangay Siloy, on the east by Barangay San Isidro, and on the west by Barangay Mauswagon. It is approximately 7.5 kilometers away from Calamba to barangay center. There are 132 households residing in the barangay which comprises (4) four puroks. The puroks have an average distance of 1.05 km. from the barangay center, and also having an average of 33 households settling per purok. Purok I appear to be density populated while purok III has the lowest number of residential households. 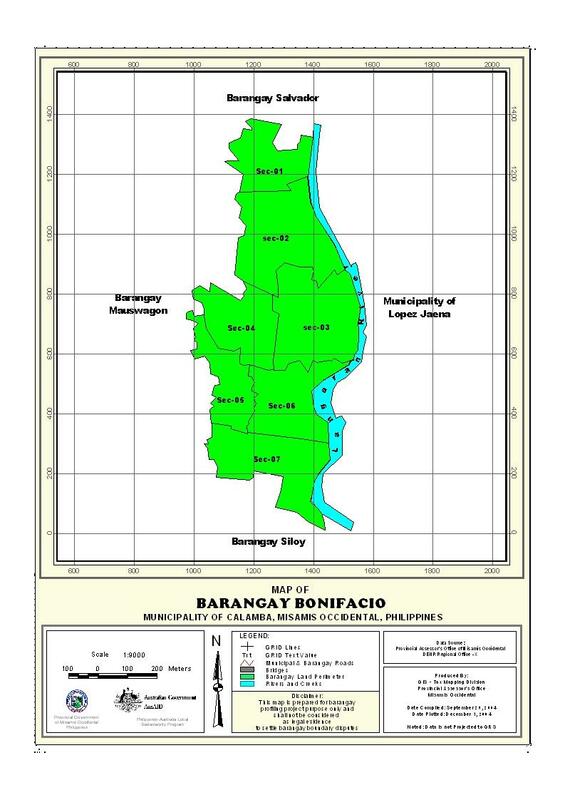 Barangay Bonifacio has a total land area of 693.8840 hectares. Barangay Bonifacio is a moderately sloping to slightly rolling slope. Estimated elevation of which in between the range from 100-200 meter above sea level and has a moderately sloping to slightly rolling slope of about 8-18%. Most of its area is coco land with some open areas planted corn, root crops and fruit trees. The barangay has a soil type of guimbaloan clay loam. Mostly are grown with coconuts, corn, root crops and fruit trees. Barangay Bonifacio is to the fourth type with no pronounced dry or wet season. The wettest period spreads over an eight-month period from May to December, however, the rainiest months are in the last quarter of the year from October to December when about 40% of the rainfall is recorded. The driest months are February, March and April. About 99.9% of the total land is used for agriculture. Only .06% is build up areas such as residential lots and barangay government sites.